We are now in Phnom Penh, after a hectic but fun last few days in Laos. We did get up extra early to see the Bat Kam- the walking of hundreds of monks down the main street of temple and culture-rich Luang Prabang, which was quite a spectacle. It has unfortunately become rather touristy, with many foreigners lining up with the locals to give the monks innapropriate food and flashing cameras in their faces, however over all it was still very interesting to see. Besides the annoyance of other tourists, we were further plagued by a nasty bout of food poisoning from our street market sausages the night before- to be expected at some stage I guess, however not very convenient before an 8 hour bus ride!! So our ‘VIP’ bus to Vang Vieng, besides not making us feel particularly ‘VIP’ with dodgy air con and sticky, cramped seats was also extremely windy with frequent hair pin bends and overall one of the less nice experiences of the trip as we both tried to avoid being sick, shitting ourselves and feinting from the heat. Lovely. BUT, we got there. To the infamous ‘party capital’ of Laos- Vang Vieng. This little town on the banks of the Nam Song River has become infamous for drunk travellers, tubing down the river, local deadly whisky, and equally deadly bars by the water ending in many broken limbs and blood baths. So we weren’t exactly sure how this would go, particularly since we were in rather fragile states. In the end we found our way to ‘Maylyn’ Guesthouse, recommended to us by a Lao guy Tim worked with. It was on the other side of the river away from the town centre, and consisted of a collection of adorable bungalows facing a small river and surrounded by an amazing garden. 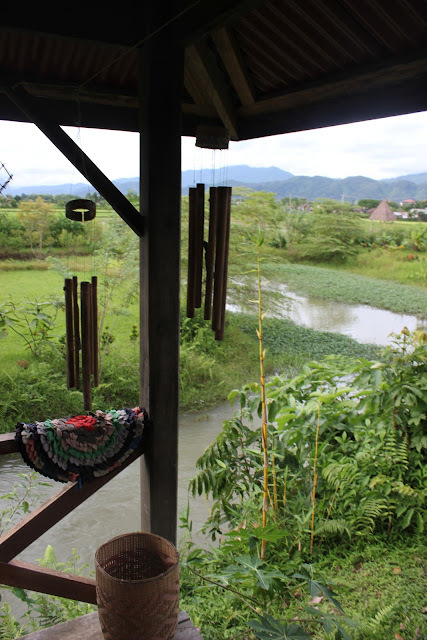 It was so peaceful and beautiful, the perfect place to relax and mend our poor tummies. 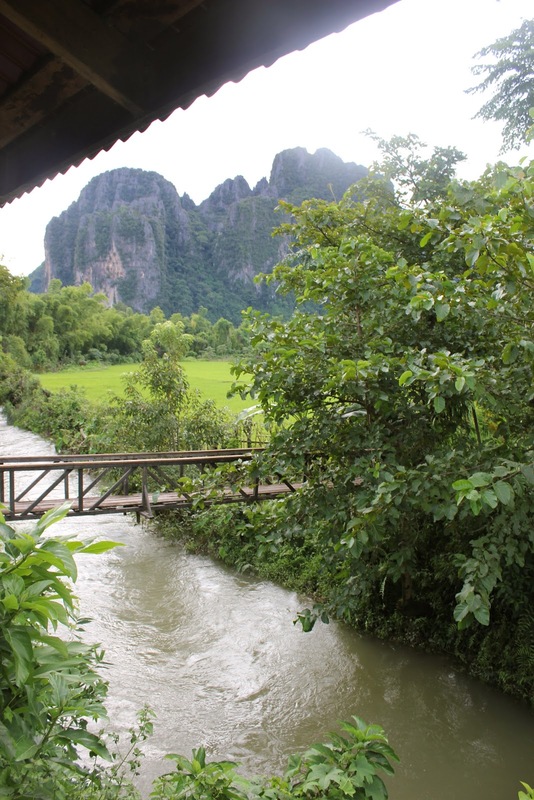 The quiet side of Vang Vieng, a peaceful villages surrounded by spectacular mountains. When we had regained some momentum we managed a great hike through rice paddy fields, little villages and past incredible mountain scenery to ‘the blue lagoon’ and a cave. The cave was an extra hike up about a billion super steep stairs and then about 200 m deep in practically pitch darkness, to find ourselves in a mass of incredible stalactites and stalagmites- it was a rather impressive cave to say the least. After the struggle back down we had a well earned swim in the beautiful lagoon. We did see the party central, however as we had still not managed to keep food down, avoided the mayhem. We would probably have tried tubing down the river and watching the shenanigans happen, however as it was, we were so glad to experience the beauty of the surrounding region and had a wonderful, relaxing time. After Vang Vieng we had a much better bus experience to Vientiane, the Lao capital. This city seemed exactly that- just a city. There weren’t really any notable sights as far as we could tell, and we were a bit sightseeing’ed-out so we just hung out and had some good food, preparing for our flight to Cambodia the next day.